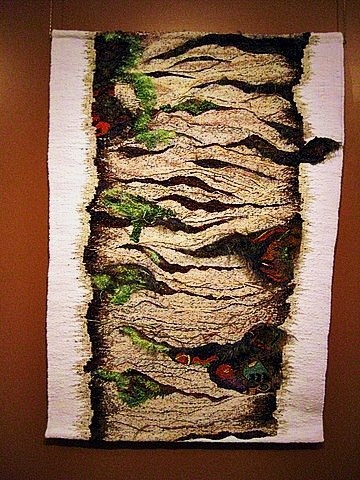 Beneath my skin is a tapestry inspired in one of my photographs from a bark tree in the middle of the snow. Eventhough I love the fascinating landscapes Canada has offered me, the influence of the maya Culture still remains and tends to sneak out of the textures of it. The materials are varied from natural (wool, cotton, linen, wool) to great synthetic ones like metallic yarns, raffia, paper, rayon, etc.